Wow! We got to read another really great book for book club this month. 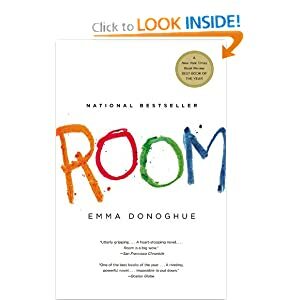 It was "Room" by Emma Donahue. What Donahue did was take an incredibly horrible situation, and put it through a child's innocent eyes. He thinks of everything as a game, and doesn't know how bad he has it. It is so touching, and the strength of the mother is totally inspiring. I read it in two days, as I really didn't want to put it down. Sounds fascinating! I would love to try to read it, but I'm not sure if I could - anything to do with children in bad situations is too intense for me since I've had kids. Good thing I read A Child Called It before I got pregnant, lol. Sounds very interesting - thanks for sharing! I read this book awhile ago, very interesting. A lot along the lines of "A Stolen Life", except that is based on a true story, and a lot harder to get through knowing that.